Sterling Children's Books, 9781454914990, 176pp. About the Author: Jeff Anderson is the author of Mechanically Inclined, Everyday Editing, 10 Things Every Writer Needs to Know, and Revision Decisions. 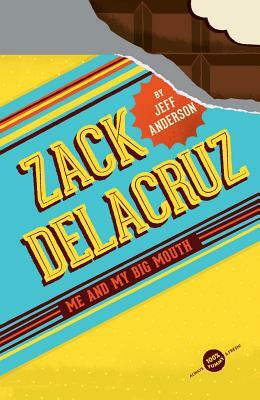 Zack Delacruz is his debut middle grade novel. Jeff grew up in Austin, Texas, and learned to love writing by journaling and crafting stories to entertain his friends over the phone. A former elementary and middle school teacher, Jeff travels to schools across the country working with teachers and students to discover joy and power in the writing process. Jeff lives with his partner, Terry, and their dogs, Carl and Paisley. Find out more about Jeff at writeguy.net or follow him on Twitter @writeguyjeff. Jeff lives in San Antonio, TX. About the Cover Illustrator: Tad Carpenter is a children's book illustrator, designer, graphic arts teacher, and cofounder of Vahalla Studios, a screen printing studio whose clients include Myspace, Ray-Ban, Polo, John Mayer, The Shins, Wilco, and Neil Young. He lives in Kansas City, MO. About the Interior Illustrator: Andrea Miller is an illustrator, a children's book designer at Sterling Publishing, and a graduate of The University of the Arts in Philadelphia. She lives with her wife, her six bookshelves, and a box of ink and brushes. Zack Delacruz is her first children's book. Find her work online at andreacmiller.com. Andrea lives in Brooklyn, NY.